Description In 1955 Micromodels had been requested by the British Embassy in Moscow to produce a model of The Kremlin, but alas it was never issued by Micromodels. The set would have cost 3/4d. In the surviving Micromodels Archive, the model artwork is nearly complete. It would only need minor finishing and colouring to produce a production model. There is no evidence of any wrapper artwork. This may well be in the archives of the American collector Myles Mandell. 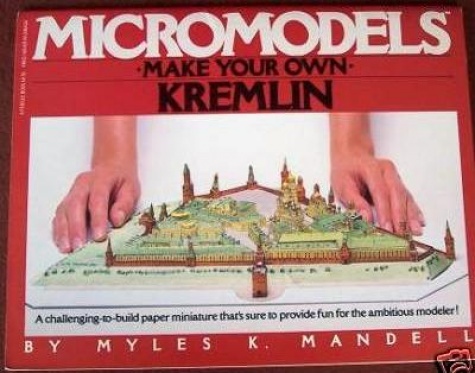 Myles Mandell issued the Kremlin in the early 1980s as part of his Perigree cut-out book series. This model is basically the Micromodels Kremlin, but scaled up approximately 2x. The models were completely redrawn, and features were added such as detailed instructions and planagraphs. This makes it easier for the novice modeller. The model shown below is the Mandell version scaled down 50%.